Easy Donuts - Kosher In The Kitch! Easy Donuts - Kosher In The Kitch! 1.Mix the first four ingredients together and let sit for a few minutes. 4. Heat the oil in the frying pan and place the donuts into it. They will start swelling almost immediately. 5. Once the donut has turned slightly brown on the bottom flip it over to the other side to brown. 6. Remove from oil, pat with a paper towel if very greasy, and sprinkle sugar/cinnamon or powdered sugar on it! 7. Eat, get fat, and be happy. This looks great! what is the point of cutting a hole in the middle? to add jelly, even though you didn’t add that to your recipe? no need for yeast? wow, super easy! The list of ingredients don’t include the quantity of sugar. Also, do you mix the doh by hand & do you knead it? Melissa, no sugar goes into the dough. 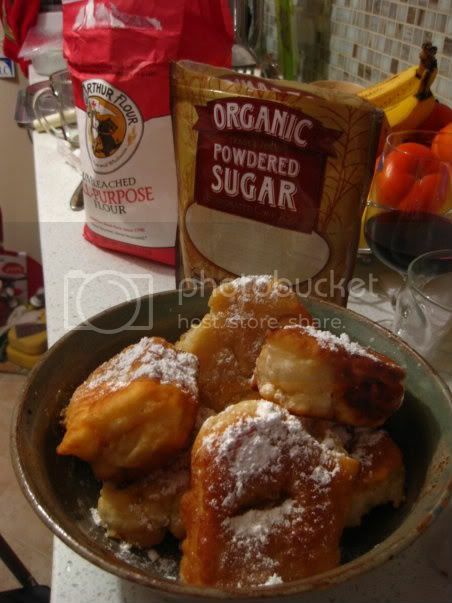 You can coat the doughnuts with sugar or powdered sugar after they are cooked. It is up to you whether you want to mix the dough or knead it, though probably a bit of both helps! Daniella, these doughnuts do have holes in them, just like regular plain doughnuts.